The K Factor: Where K=kindness, and the factor is everything that leads to it. Excellence is possible when you tap into your inner strength and have kindness at the core. Build the Strength Within is the theme and also the book! People all over the world are in a state of need, high need and on every level; psychologically, emotionally, financially, spiritually, physically, and socially. How do we all get our needs met? It happens through human connections. We want those connections to contain the many elements of kindness. Kindness is the global currency! With it, everything becomes possible. Think about it, when someone extends kindness to you, you become more receptive to what they want to say to you. You become more willing to listen and think and then offer a thoughtful reply. When someone extends kindness to you, you are willing to take action on their behalf and be helpful in ways that otherwise you might not consider. Kindness buys reception and cooperation and loyalty; those are the ingredients necessary for creating a productive business or career and also a happy and fulfilling life. 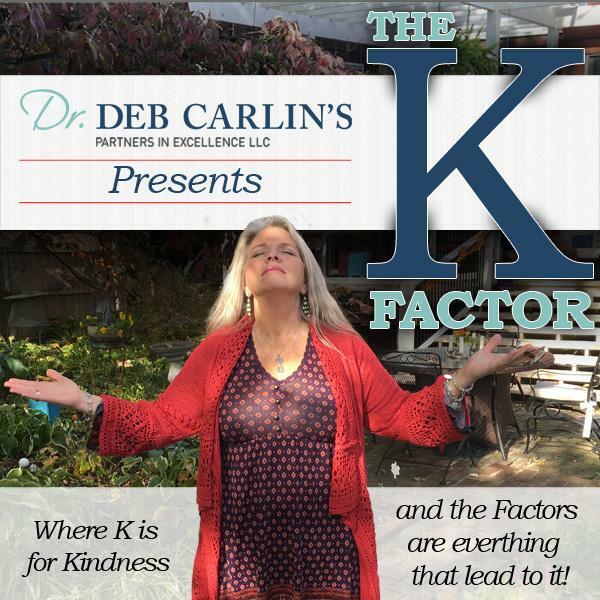 Do you have The K Factor working for your life? Are you Building the Strength Within? Come listen as Dr. Deb Carlin interviews all sorts of interesting people about this fascinating reality! The show is live and you can call in on the air. Join the fun! Add The K Factor to your schedule and your life. You will learn how to leverage the stress in your life and cultivate a perspective you will find most rewarding. Contact our staff through e-mail at: info@drdebcarlin.com or give us a call at 855-344-1940. Dr Deb Carlin interviews Walter Gregory who has been organic farming for nearly 6 decades. Oh my......you do not want to miss this one! Chicago, my home town, has been needing and craving a win for over a centrury. Wow. What happens now and next? As leaves turn, the sun fades, the days shorten, does your K Factor shift?